My bicycle came with a flat bar and some round rubbery grips. Because the geometry much of the rider weight is on the hands. It was horrible. The grips felt uncomfortable the moment I got on the bike and got worse the longer it was ridden. Even after raising and replacing the handlebar the grips still felt very uncomfortable. It could be because ether are intended to be used with cycling gloves, but I was not going to bother and try; the grips had to go. A handlebar without grips is even worse, so I needed something else. There are so many different brands available and many brands have dozens of similar looking models at different prices. Their comfort and durability is impossible to judge from pictures on the internet. Eventually I opted for the German Ergon brand. They are quite expensive but at least they have some clearly distinguishable product lines and it seems like they put a lot of effort in creating high quality ergonomic grips. I got the basic model; the Ergon GP1, they don't have integrated bar ends and come in two sizes and shorter versions for grip shifters. I got the large ones. They also come in bio-cork and leather, if that is more your style. For each one there is also a version for gripshifters that is shorter on the right side. I mounted them on the Ergotec Boomerang handlebar. Installation was easy; slide them on the handlebar and tighten the bolt with an hex key. Then I went for a ride, found that the "wing" was a little bit too high for my liking, adjusted it and then it was perfect. 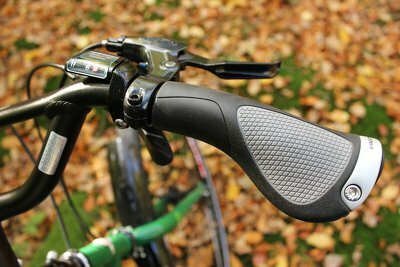 These grips made the biggest difference of all the modifications I made to my bicycle. 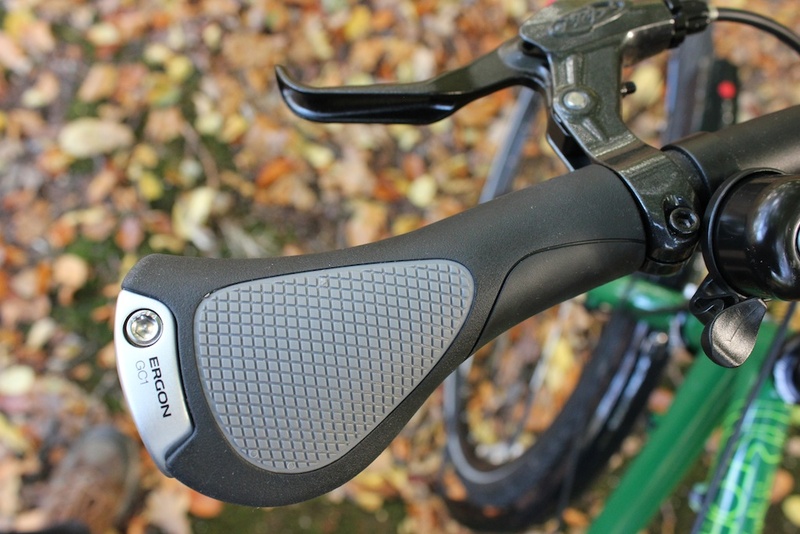 The original grips would feel unpleasant the moment I got on, while with the Ergon's the whole experience is suddenly pleasant. As a bonus it comes with handlebar caps, and they actually fit my handlebar. The handlebar are made with thicker tubing and at least 3 different types of caps did not fit. It did require a little bit more force than normal but the Ergon caps fit! Ergon GP1 on the right side. For my girlfriend's bicycle I got the Ergon GC1 grips. These are relatively new in the line up and only come in one size. There is a version for gripshifters that is shorter on the right side. Since 2014 there is also a bio-cork version. They are very similar to the GP1 in both price and appearance. The only major difference is that they are intended for more curved handlebars that have a backsweep between 30 and 60 degrees. This is expressed by having a little bit more body at the front near the end of the grips. The Ergotec Space handlebar has a backsweep of 34 degrees. I think the GP1's would have been just as good at this angle, but at 45 degrees it might be the better choice. The Ergon GC1 has a little plastic ridge at the far end on the inside at the end that prevents you from sliding them over the handlebar. This prevented me from adding bar ends. With a round file I was able to file it off. The GP1 does not have this ridge. Ergon GC1 on the left side. I highly recommend these Ergon grips! For me they increased the riding comfort more than I could imagine. They are totally worth the money. Although it is possible to use bar ends with the GP1 it requires you to move the grips further down the handlebar, for which in my case there is no space. The only option is to upgrade to the GP2, GP3, GP4 or GP5 which requires me to replace the whole grip. The GC1 is an equally nice grip, but as long as your handlebar has a backsweep of less than 35 degrees I think the GP1 would do fine too. Should I have anything additional to report or change my opinion I will update this article.